We have been enjoying some incredibly hot weather recently, which meant that none of us wanted to get anywhere near the iron to press and pack a nice big order for devotedtodachshunds.co.uk. After a bit of a reshuffle to find the coolest spot in the studio, we got cracking and they have been sent on their way. Wire haired dachshunds looking smart in their red ribbon and bow tie. Newly embroidered and ready to be folded with our super technical napkin folding board! Following on from the success of the dachshund Christmas crackers, we have been asked to create some large napkins. Each set of two napkins is beautifully embroidered with a Mr. & Mrs. Dachshund. The boys are embroidered sporting a smart red bow tie and the girls an elegant ribbon tied in a bow. There are four designs available, including the black and tan, red and new wire haired and long haired dachshunds. All the napkins rolled and ready to go. All four new designs shown in ivory cotton and natural linen versions. We are really pleased with the final outcome and we can’t wait to hear what the customers at devotedtodachshunds.co.uk think. In the meantime we are off to celebrate with an ice lolly! Categories: Products | Tags: Dachshund Gifts, Dachshund Lover, digital embroidery, Embroidered Tableware, embroidery, Handmade, Kate Sproston Design, Made in the UK, Sausage Dog, Sausage dog gifts | Permalink. 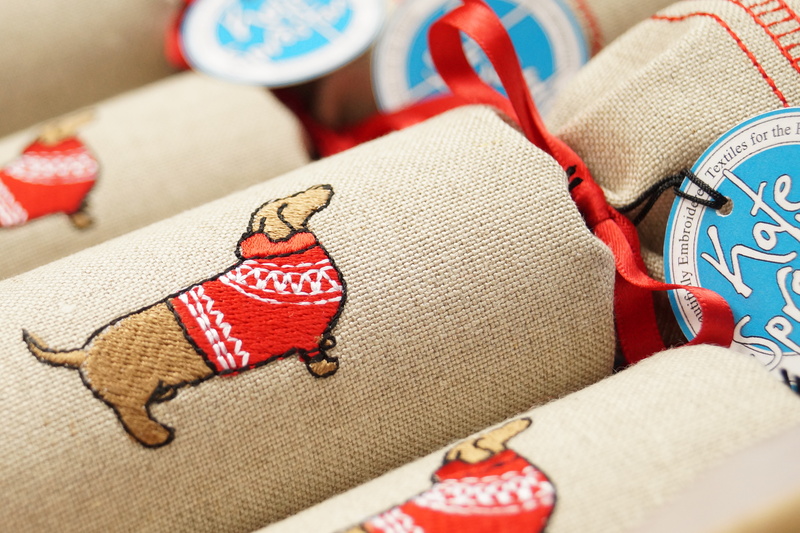 Having teased you all for quite a while now, we are very excited to share our new Dachshund Reusable Christmas Crackers. Designed especially for the lovely Selina, founder of the Devoted to Dachshunds website (devotedtodachshunds.co.uk). The site is a heaven for all sausage dog lovers everywhere, and since embarking on this project we can safely say we all want our own four legged sausage friend! 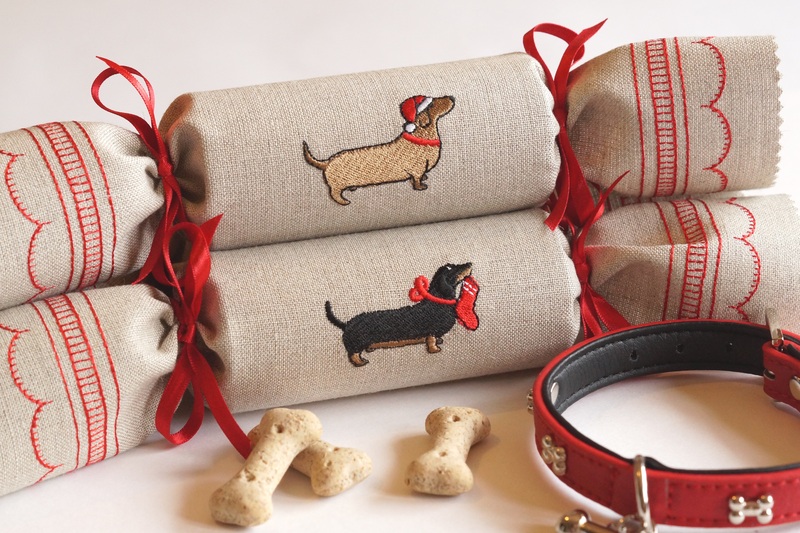 Our brand new reusable Christmas crackers featuring beautifully embroidered festive dachshunds. The design process starts with some initial research and sketches of possible ideas. We then make some detailed drawings and recreate the chosen image on the computer, converting it to stitch. 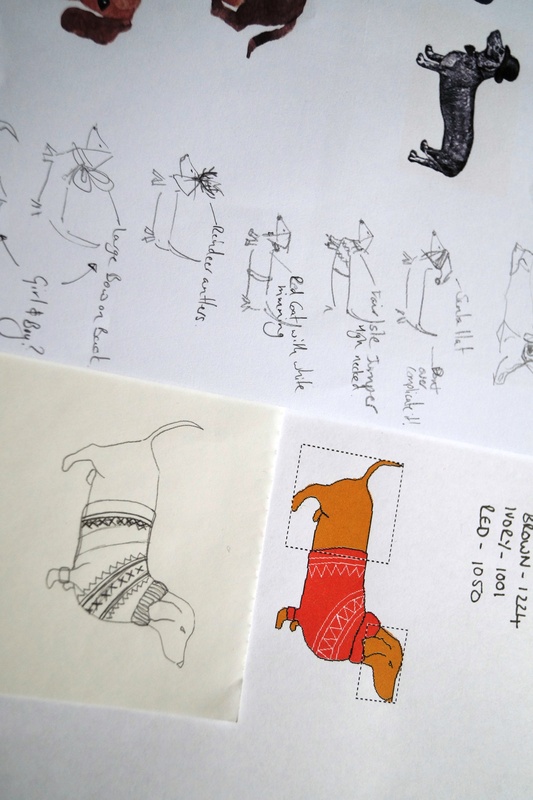 Research and original sketches for the dachshund motifs. Once we had created the first samples on our own embroidery machines, we took them to the Benton & Johnson factory in Bedworth. They have a huge twelve head embroidery machines which meant twelve crackers could be embroidered at once. We were absolutely fascinated when the machines were in motion, but please excuse the rookie mistake of incorrect camera rotation! Each cracker was then pressed, crimped and tied. We then added one of our brand new swing tags and boxed them up ready to be sent to their new home. Left: A big pile of the embroidered crackers ready to by rolled and tied. Right: The finished crackers complete with tags ready to be dispatched. There are four designs to choose from (our favorite is the one in the Christmas jumper) and will be ready to purchase in the Autumn 2015. Our favorite design, a little sausage dog proudly wearing a Christmas jumper. Categories: Behind the Scenes | Tags: Christmas Cracker, Christmas Decorations, Dashchund, digital embroidery machine, embroidered, embroidery, Handmade, Kate Sproston Design, Made in the UK, Natural Linen, Sausage Dog, textiles | Permalink.